Luft Mattress Review, The Hybrid Mattress to Beat? Luft is an impressive mattress from a brand new company. If you are looking for an hybrid design, definitely worth checking out! 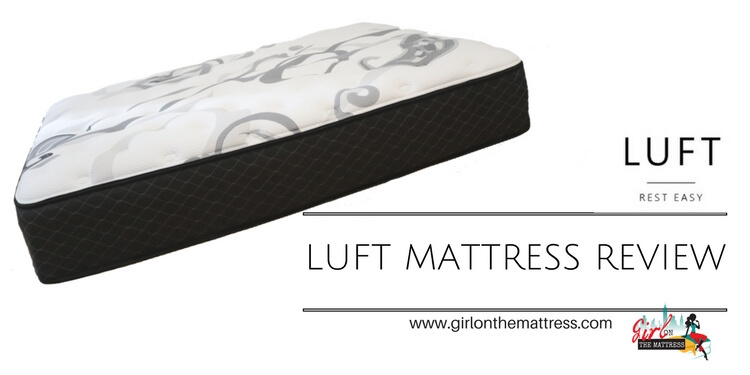 Luft changed their mattress, it does look different, and I’m working on my updated review at this moment. See the new mattress here for now. The Luft Mattress totals to 14-inches and is made up of 5 layers of spring and foam to create a plush and comfortable bed you can enjoy. First Layer: Composed of 2-inches of gel-infused cooling foam that’s been crafted with a quilt finish. This creates a breathable and comfortable layer that gives you comfort the moment you hit the mattress. Second Layer: Made up of 1-inch of graphite infused memory foam, which promotes cooling and helps to evenly distribute body weight. Third Layer: Composed of 2-inches of polyurethane foam that provides a support layer for the layers underneath. Fourth Layer: Composed of an 8-inch zone that contains 1074 individually wrapped coil springs with an enhanced edge support to ensure durability. Fifth Layer: Composed of 1-inch of high support polyurethane foam that serves as a durable base and support layer. One of the prettiest mattresses you’ll see around, the Luft Mattress features a two tone cover with the top featuring a white base with gray swirls and the sides in a dull dark gray shade. Both the top and sides are quilted to perfection, giving the piece a classic yet luxurious look. The cover itself is made from high loft fiber, which is soft and cool, allowing for great breathability and comfort. 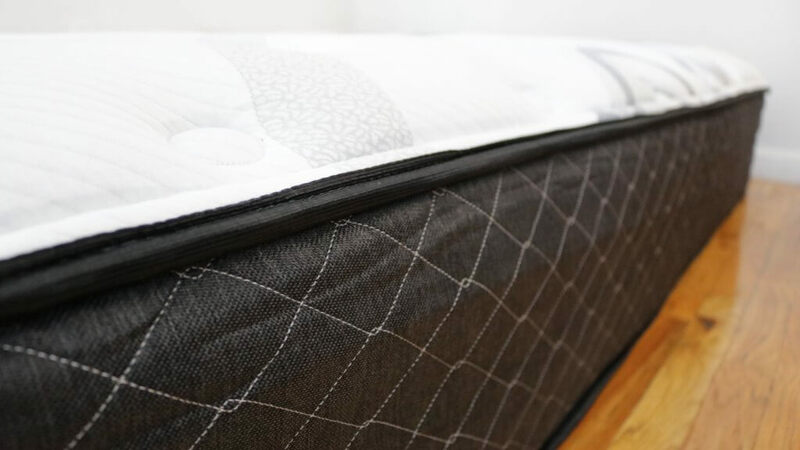 The Luft Mattress combines some of the best aspects of a hybrid mattress into one solid piece. When you first unbox it, there’s minimal off-gassing which is a huge plus. It also has the aesthetics to match any luxurious bed thanks to the wonderful cover and the quilted top. As for performance, it offers a true medium firmness with minimal motion transfer. This makes it ideal when you’re sleeping with a partner. It’s highly recommended for back sleepers too because you get full support with a good amount of bounce thanks to the coil springs. Heavier set individuals will also love it because it won’t immediately sink thanks to the durable construction and quality edge support that comes with the mattress. If you want a hybrid mattress that’s built with great quality without breaking your budget, the Luft Mattress is a great contender. What I love about it is that it’s completely made with great materials and a big emphasis on how each of these materials perform. 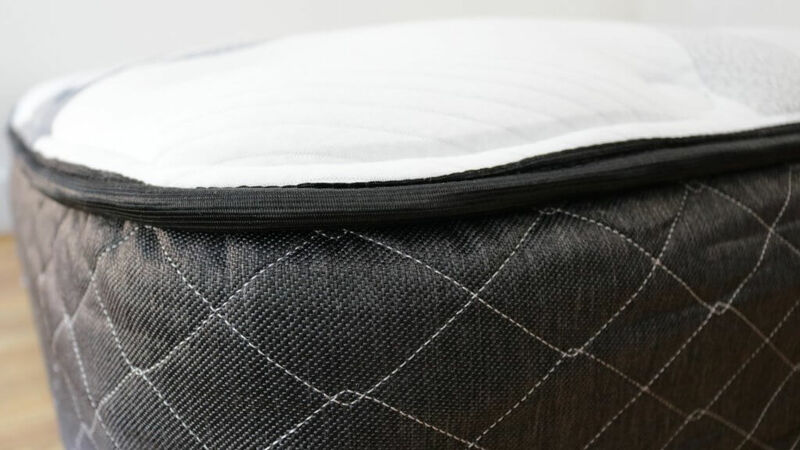 The super plush quilted cover provides added drama and comfort to the piece while the durable edge support, breathable nature as well as minimal motion transfer make it a fantastic choice. Even better is that you know the company has manufacturing capacity behind their product, which means they definitely know what they’re doing. This mattress is amazing and very comfortable. I absolutely love it! This mattress is so amazing and comfy. I absolutely love it! I would never want to get out of bed. Would love to be blessed with this mattress. I sure do need another one for my family & I. This would be an awesome win if I win this!!! Thanks for the chance. I want this for my back/neck problems. This sounds like the perfect mattress for me. I want it! Would like to get out of the sag in my current mattress, let’s try this. It’s been over 10 years since we purchased a mattress. Time now??? I need a new mattress! This looks perfect! i enter all mattress sweepstakes for the obvious reason, i need a new mattress. thank you . Is it plush and soft?